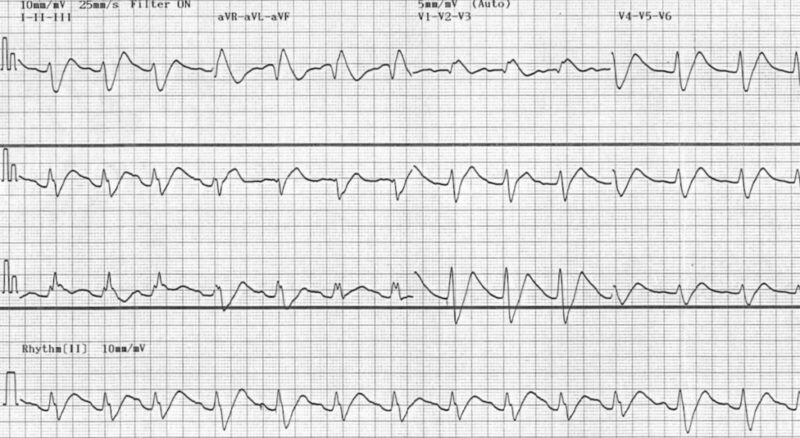 The ECG is a vital tool in the prompt diagnosis of poisoning with sodium-channel blocking medications such as tricyclic antidepressant (TCA) overdose. 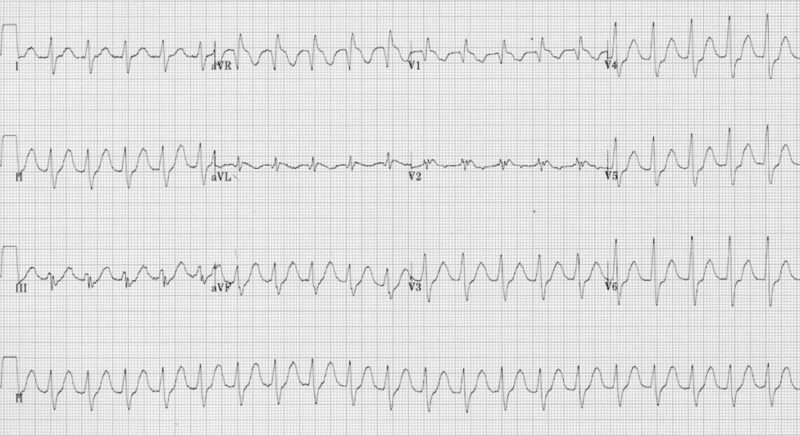 Handy tip: An ECG should be taken in all patients who present with a deliberate self-poisoning (or altered GCS of unknown aetiology) to screen for TCA overdose. Patients with tricyclic overdose will also usually demonstrate sinus tachycardia secondary to muscarinic (M1) receptor blockade. Tricyclics mediate their cardiotoxic effects via blockade of myocardial fast sodium channels (QRS prolongation, tall R wave in aVR), inhibition of potassium channels (QTc prolongation) and direct myocardial depression. Patients need to be managed in a monitored area equipped for airway management and resuscitation. Secure IV access, administer high flow oxygen and attach monitoring equipment. Administer IV sodium bicarbonate 100 mEq (1-2 mEq / kg); repeat every few minutes until BP improves and QRS complexes begin to narrow. Intubate as soon as possible. Hyperventilate to maintain a pH of 7.50 – 7.55. Once the airway is secure, place a nasogastric tube and give 50g (1g/kg) of activated charcoal. Treat seizures with IV benzodiazepines (e.g. diazepam 5-10mg). Treat hypotension with a crystalloid bolus (10-20 mL/kg). If this is unsuccessful in restoring BP then consider starting vasopressors (e.g. noradrenaline infusion). If arrhythmias occur, the first step is to give more sodium bicarbonate. Lidocaine (1.5mg/kg) IV is a third-line agent (after bicarbonate and hyperventilation) once pH is > 7.5. Avoid Ia (procainamide) and Ic (flecainide) antiarrhythmics, beta-blockers and amiodarone as they may worsen hypotension and conduction abnormalities. 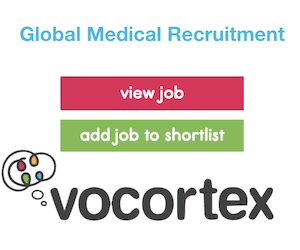 Admit the patient to the intensive care unit for ongoing management. Sinus tachycardia with first-degree AV block (P waves hidden in the T waves, best seen in V1-2). Positive R’ wave in aVR. 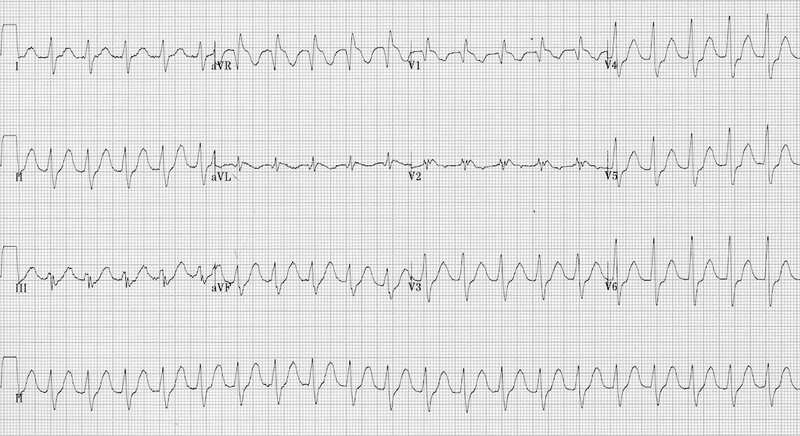 A second ECG of the same patient showing worsening TCA cardiotoxicity with marked QRS broadening producing a sine wave appearance reminiscent of hyperkalaemia. 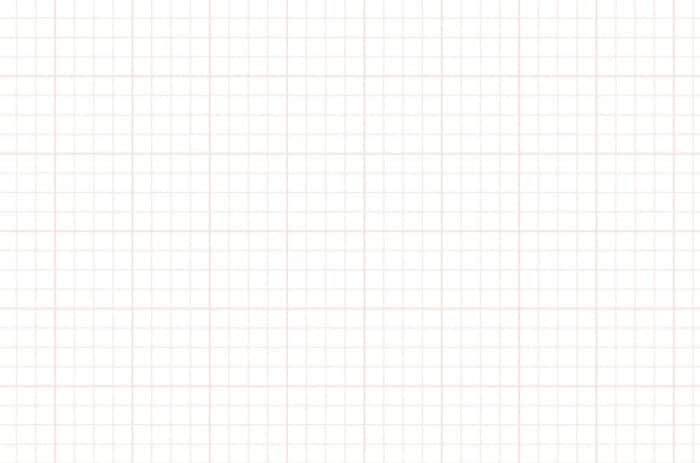 Third ECG of the same patient after serum alkalinisation with sodium bicarbonate, intubation and hyperventilation. 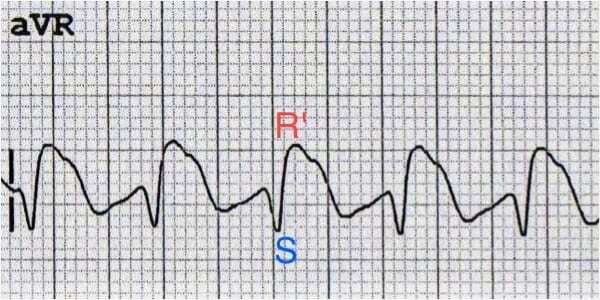 The QRS duration has narrowed back to normal and the R’ wave in aVR has disappeared. 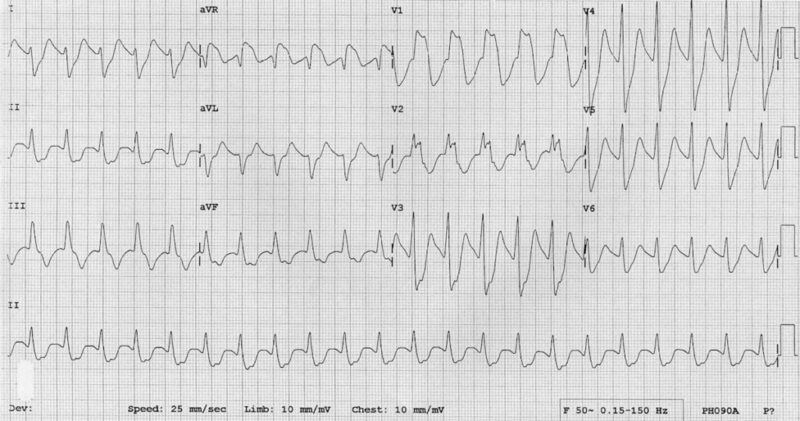 Another example of severe TCA cardiotoxicity after ingestion of 35 mg/kg doxepin. 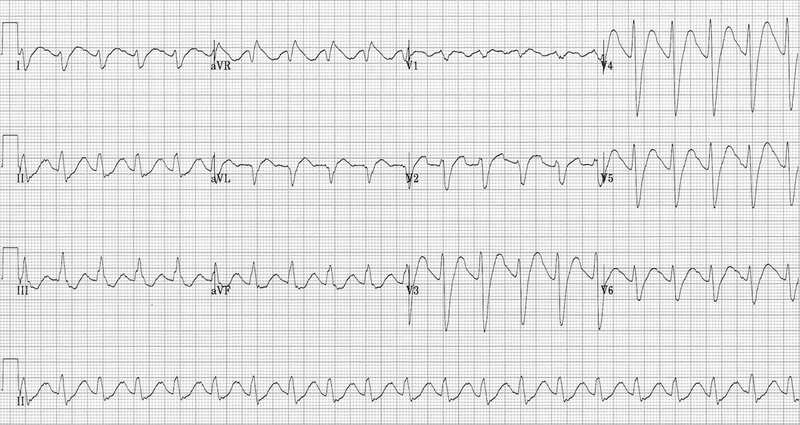 There is marked QRS widening with tachycardia and a positive R’ wave in aVR. Similar ECG changes are seen with other sodium-channel blocking agents. This ECG demonstrates QRS widening and positive R’ wave in aVR consistent with sodium-channel blockade in a patient with flecainide poisoning. Another example of flecainide cardiotoxicity.